With the new automation, LifeArts Integrated Health Center sees more patients per day while saving administrative staff nearly 20 hours a week. LifeArts Integrated Health Center in Plattsmouth, Nebraska, implemented a patient experience management platform this past year. The technology is designed to be used across any in-office or personal device, offering a consistent and intuitive digital waiting room experience between patients and the practice. The practice quickly realized results: Its caregiver is seeing two to three more patients per day while its administrative staff are saving nearly 20 hours a week on administrative tasks, including saving 15-20 minutes of time per patient and reducing new client blocks from one hour to 35 to 40 minutes. Further, the tool has “made it easy for patients to view and pay their own balances and save their payment preferences, resulting in a substantial increase in patient collections for 2017,” said Julie Howard, FNP, a chiropractor and family nurse practitioner at LifeArts, describing the Breeze platform from vendor CareCloud. The practice also uses CareCloud’s electronic health record and practice management systems. “My accountant even commented on the difference in our bottom line – we boosted our billings by more than 27 percent compared to a year ago,” said Howard. The icing on the cake for Howard is that now she has her weekends off and evenings free. She has time to be with her family and have the work-life balance that she so desperately wanted. “I love what I’m doing again and can finally be the provider that I’ve always wanted to be – and that starts with being able to put my patients first,” she said. This all started a couple of years ago when Howard was so frustrated with the inefficiencies of managing the operations and paperwork associated with her practice that she was considering a job elsewhere and closing her practice altogether. As a solo practitioner, she was working 12 hours a day, seven days a week, and was burned out. “Beyond the long hours, I knew there was a better way to connect with my patients and make the experience easier and more efficient for them, too, so we sought a new system for managing our practice,” Howard explained. She decided she did not want to have the kind of office where patients had to wait hours before they could see her. Having outdated check-in and check-out procedures meant restricting scheduling significantly to account for the time needed for administrative work around a patient’s appointment. 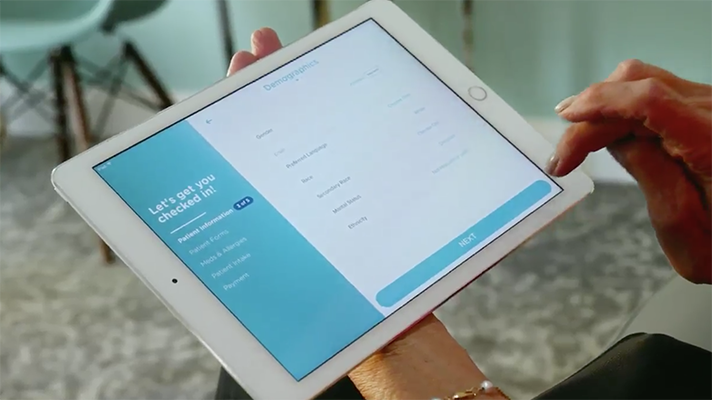 With the new patient experience platform, patients check in much more quickly, they see their account balances, and often pay before Howard is even aware they are present, she said. The process is simple and quick, and the practice is seeing more patients in the same amount of time without having to sacrifice the quality of care that they receive, she added. The new practice management, EHR and patient experience management systems ticked off all the boxes for LifeArts, offering multi-specialty support with the backing of a strong support team, Howard said. Other patient experience systems on the market include offerings from AdvancedMD, Medfusion, Q-nomy, SE Healthcare and more. Staff enjoys the Breeze patient experience system. For instance, the receptionist has more free time now to take some of the daily tasks off Howard’s desk, such as taking ownership of patient billing and collections. The receptionist also is able to schedule and reschedule patients much more efficiently, allowing the practice to have better flow of patients through the office, she added. Breeze easily connects with CareCloud’s practice management and EHR systems and instantly populates intake information to the patient chart. Many patients like to check in on their phones, and with Breeze, they check in from their phone in the morning for their afternoon appointment, so Howard knows it won’t be a no-show. In the last year, appointment no-shows for LifeArts have decreased by 66 percent to less than 1 percent of all appointments, Howard said.